I'm a huge fan of trail mix, although I've unfortunately found that there are few very low calorie trail mixes that you can buy at the store. You can, of course, make your own trail mix at home by combining and weighing ingredients like soy nuts, small chocolate chips, dried fruit, low calorie cereal, etc., but sometimes it is nice to buy yummy pre-made trail mix for times when you want a diverse snack or want to add crunch to some yogurt, frozen yogurt, cereal, regular fruit, or low calorie ice cream, and haven't planned ahead. My two favorite ways to eat the cocoa nib mix is to sprinkle a very small portion on my ice cream, fage yogurt, or to literally eat it straight out the bag (although the pieces are a bit tinier than most trail mix which make eating it with your hands a bit messier than you might expect). 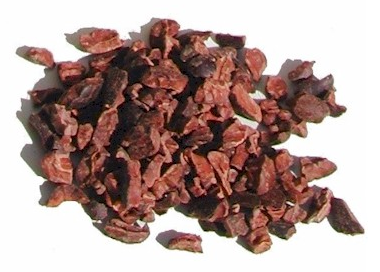 The cocoa nib mix is definitely a low calorie, healthy, well rounded snack (and trail mix substitute) at only 112 calories per serving, 3 grams of fat, 3 grams of natural fiber, 3 grams of protein, and 2 weight watchers (WW) points. On top of their great nutritional information, and all natural ingredient list, the trail mix of course contain the added benefits of having antioxidants in it from the cocoa. 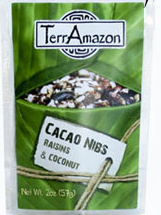 Finding the Cocoa Nibs might be challenging (look at your local vegan, vegetarian, or health store), but they are well worth looking for.